Cormorant on pile by the Old Quay bridge to Wigg Island on the South bank of the Mersey at Runcorn. 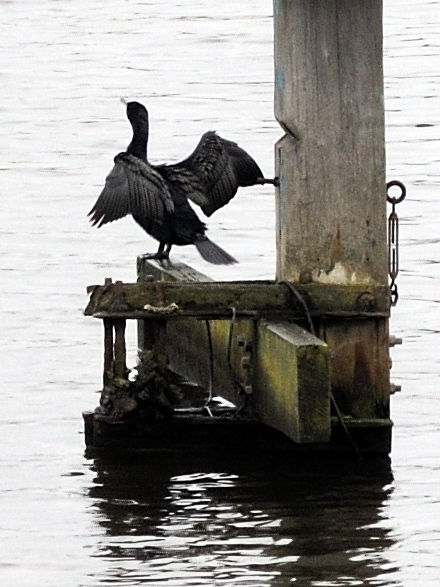 It was a rainy day and I was taking pics of the bridges when this cormorant found its perch. With my P7800 fully extended I took a few shots. I am very impressed with the sharpness even though the image is not large. This is right down to the pixels. No reduction and from a RAW file. → Cormorant on pile by the Old Quay bridge to Wigg Island on the South bank of the Mersey at Runcorn.